Nic Wilson, former Decatur Active Living participant and Decatur High School Student is having success in the classroom and on the baseball diamong. 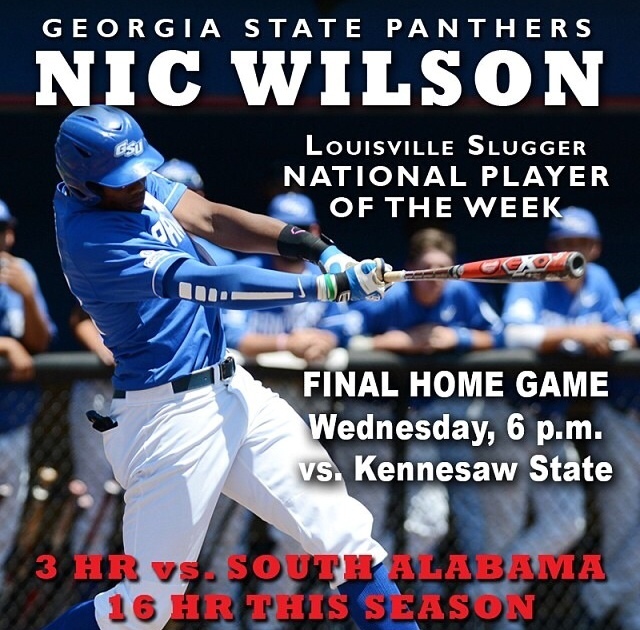 After his three-home run game Sunday, Georgia State’s Nic Wilson was named Louisville Slugger National Player of the Week for the second time this season. Wilson, the senior from Decatur tied the school and Sun Belt Conference single-game record with three round-trippers to lead GSU to a 15-10, series-clinching win over South Alabama. He now has 16 home runs on the season to rank third in the nation, trailing only A. J. Reed of Kentucky (20) and Brandon Thomasson of Tennessee Tech (17). Wilson homered in three consecutive at-bats with a solo homer to right center in the fourth inning, a two-run blast to center in the sixth that put the Panthers ahead for good and another two-run bomb to left in the seventh. For the week, Wilson hit .308 (4-13) with a 1.077 slugging percentage. He had three homers, a double and five RBI’s in three games. Wilson first earned the Louisville Slugger award on March 17 after hitting .579 (11-19) with five homers and 15 RBI’s in five games. Wilson and the Panthers play their final home game Wednesday, hosting Kennesaw State at 6pm at the GSU Baseball Complex. Congratulations to Nic Wilson and he started playing at Oakhurst Park several years ago in the Decatur Active Living Youth Baseball Program.